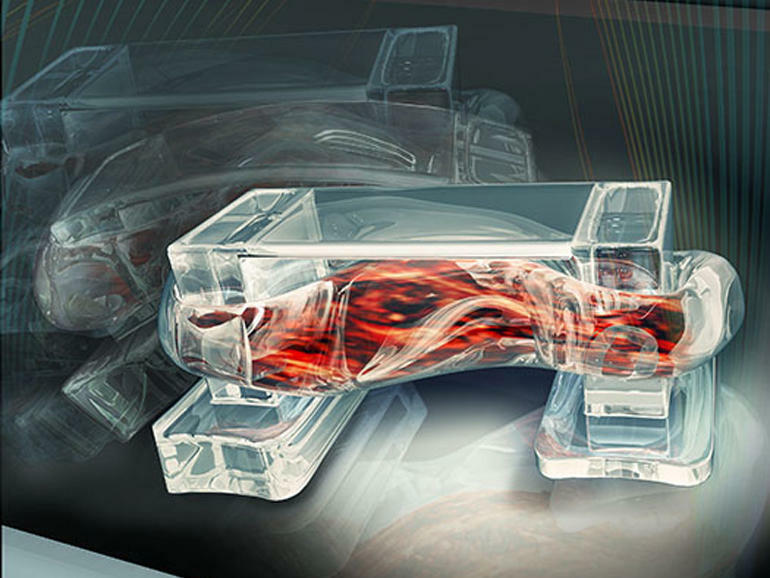 Biological machines call "bio-bots" are a fusion of biology and engineering. They are powered by skeletal muscle cells controlled by electronic impulses. This work is being funded through NSF's Science and Technoly Center program. The Center for Emergent Behavior of Integrated Cellular Systems ’ mission is to create a new scientific discipline for building living, multi-cellular machines that solve real world problems in health, security, and the environment. The major reports on convergence [1-6] discuss numerous examples of convergence, as well as describing future opportunities for convergent approaches to meet a variety of research challenges. The examples in [1-3] contain a comprehensive discussion of the impact of convergence in the health sciences, while the examples in [4-6] are focused more on nanotechnology, biotechnology, and information technology. NRC (National Research Council). 2014. Convergence: Facilitating Transdisciplinary Integration of Life Sciences, Physical Sciences, Engineering, and Beyond. Washington, DC: The National Academies Press. NSF (National Science Foundation). 2002. Converging Technologies for Improving Human Performance: NANOTECHNOLOGY, BIOTECHNOLOGY, INFORMATION TECHNOLOGY AND COGNITIVE SCIENCE. Edited by Mihail C. Roco and William Sims Bainbridge, National Science Foundation. Roco, MC et al 2013. Converging Knowledge, Technology and Society: Beyond Convergence of Nano-Bio- Info-Cognitive Technologies, edited by M.C. Roco, W.S. Bainbridge, B. Tonn and G. Whitesides, National Science Foundation/World Technology Evaluation Center report, Springer 2013, Boston (available on http://www.wtec.org/NBIC2-report). W. S. Bainbridge and M. C. Roco 2016. Handbook of Science and Technology Convergence, Springer Reference, Berlin. The examples listed below describe related but complementary exemplars of convergence. A convergence between the life sciences, physical sciences, computer sciences, and engineering is driving research in Cyber-Physical Systems (CPS). These are smart networked systems with embedded sensors, processors, and actuators, which are designed to sense and interact with the physical world. In CPS systems, the joint behavior of the “cyber” and “physical” elements of the system is critical - computing, control, sensing and networking can be deeply integrated into every component, and the actions of components and systems must be safe and interoperable. Agriculture: CPS technologies will play a key role in precision agriculture, which is making food production smarter, more efficient, and sustainable. Building Infrastructure and Transportation: Advances in cyber physical systems are changing the way buildings, roads, vehicles, and bridges are controlled and operated. Energy: CPS technologies are essential to the creation of a smart electric grid, which will provide an adaptive, resilient, efficient, and cost-effective electricity distribution system. Healthcare: The opportunities provided by inexpensive sensing and 3-D printing are leading to the development of a broad range of transformative cyber-physical medical products. Manufacturing: CPS technologies are vital to preserving our national competitiveness in manufacturing and for national security. The “convergence of the global industrial system with the power of advanced computing, analytics, low-cost sensing, and new levels of connectivity permitted by the Internet” has also been called the Industrial Internet . The Foundation’s primary investment in CPS is through the Cyber-Physical Systems (CPS) Solicitation 17-529. The goal of the CPS program is to develop the core system science needed to engineer complex cyber-physical systems that people can use or interact with and depend upon. The program aims to foster a research community committed to advancing research and education in CPS and to transitioning CPS science and technology into engineering practice. By abstracting from the particulars of specific systems and application domains, the CPS program seeks to reveal cross-cutting fundamental scientific and engineering principles that underpin the integration of cyber and physical elements across all application sectors. There is also a convergence of CPS technologies and research thrusts that underpin Smart & Connected Communities and the Internet of Things. In September 2016 the National Science Foundation (NSF) announced three, five-year "Frontier" awards, totaling more than $13 million, to advance cyber-physical systems (CPS) -- engineered systems that integrate computational and physical components to improve productivity, efficiency and the quality of life . In these projects researchers from the computer science and engineering fields will partner with scholars in urban planning, materials science, music and other non-traditional domains to design solutions that can be applied to new environments and tasks. Frontier projects are designed to address CPS challenges that cannot be achieved by smaller efforts. To complement its research program in CPS, NSF is also exploring issues for training and education. NSF asked the National Academies of Sciences, Engineering, and Medicine to study the topic, organize workshops, and prepare interim and final reports examining the need for and content of a CPS education. The results of this study are intended to inform those who might support efforts to develop curricula and materials; faculty and university administrators; industries with needs for CPS workers; and current and potential students about intellectual foundations, workforce requirements, employment opportunities, and curricular needs . National Academies of Sciences, Engineering, and Medicine. 2016. A 21st Century Cyber-Physical Systems Education. Washington, DC: The National Academies Press. NSF established the Science and Technology Research (STC) Centers Program in 1989 to help maintain U.S. preeminence in science and technology and ensure the requisite pool of scientists with the quality and breadth of experience required to meet the changing needs of science and society. The Center of Advanced Materials for Purification of Water with Systems (The WaterCAMPWS)  is a research and education center for increasing water supplies for human use through enhanced treatment technologies. The goals of the Center are grounded in a belief that the challenges in increasing potable water supplies can be solved by focusing on the basic science of the aqueous interface, and developing advanced materials and systems that exploit the unique physics and chemistry at the interface. The Center adopted a novel convergence strategy that initially built upon the expertise of researchers in material science, mechanical engineering, and chemistry who are not part of the traditional water research community. Colorado State University’s Center for Multi-Scale Modeling of Atmospheric Processes (CMMAP)  is pioneering the use of multi-scale modeling in the study of atmospheric processes. Their research is focused on improving the representation of cloud processing in climate models. The field of atmospheric science has traditionally been organized around three discretely separate scales of analysis: small scale (100 times smaller than the earth); medium scale- (earth scale); large scale-(whole atmosphere). This division presents major challenges when trying to understand the role of clouds in climate simulation, because clouds are many times smaller than the grid cells used in the climate models. The Center for Brains, Minds and Machines (CBMM)  is a Science and Technology Center focused on the interdisciplinary study of intelligence. This effort is a multi-institutional collaboration headquartered at the McGovern Institute for Brain Research at MIT, with managing partners at Harvard University. The Center is working to create a new field, the Science and Engineering of Intelligence, dedicated to developing a computationally based understanding of human intelligence and establishing an engineering practice based on that understanding. The Center employs a convergence approach in bringing together computer scientists, cognitive scientists, and neuroscientists to work in close collaboration. It is grounded in the belief that seminal contributions are most likely to emerge from collaborative efforts. Collaborative projects between and among participants, rather than efforts limited to the research group of an individual participant, are the desired outcome. The Center is also founded on the premise that its objectives are best reached by establishing a new field of study. To further this end, Center participants, and especially our students and postdocs, are expected to have broad interests and participate energetically in Center research and education activities. A convergence among the life sciences, physical sciences, and engineering is driving the emerging field of synthetic biology, which aims to construct new biological entities and redesign existing ones. Synthetic biology is a set of ideas, tools, and techniques integrating engineering and biology. It employs engineering design principles in the development of new functions or applications in areas such as health, energy, and the environment. Driven by the need for standardized and sustainable biological parts, synthetic biology applies engineering principles to achieve high levels of control in manipulating or creating new cells and organisms. Synthetic biology offers promise as a tool to address key challenges such as food security and sustainable energy. On July 9-10, 2009, under the auspices of the National Academies, the Organization for Economic Cooperation and Development, and the Royal Society, an international symposium was held in Washington, DC to bring together the scientific, engineering, legal, and policy communities along with members of the public to explore the opportunities and challenges posed by synthetic biology . The National Science Foundation has supported transformative research in synthetic biology for over a decade. A historical summary of NSF investments in synthetic biology has been compiled by Dr. Susanne von Bodman, Program Director for the NSF Systems and Synthetic Biology program and Dr. Theresa Good, Deputy Division Director for the Division of Molecular and Cellular Biosciences. They estimate the total US investment in Synthetic Biology during the period 2006- 2013 to be in excess of $600 million . engage the public about the opportunities and challenges of engineering biology. The Center for Biorenewable Chemicals, CBiRC , was established in 2008 as an NSF Engineering Research Center at Iowa State University. (CBiRC) is developing the tools, components and materials needed to transform carbohydrate feedstocks into bio-based chemicals. The Center seeks to combine bio-catalysis and chemical catalysis CBiRC to create powerful systems that have the potential to nurture a sustainable bio-based chemical industry. CBiRC believes it can enable the growth of the nascent bio-based chemical industry with key bio-based foundational intermediates that deliver an array of drop-in chemistry or similar functionality to existing fossil-carbon-based chemicals. In 2012 the NSF began its participation in ERASynBio , an international initiative of funding agencies to promote the development of Synthetic Biology and to cultivate and coordinate national efforts and funding programs. Nanotechnology and its offspring comprise the most thoroughly studied examples of convergence. Through a series of books and papers over the past 15 years, Roco, Bainbridge, and their collaborators have systematically documented the role of convergence in the development of new lines of inquiry along with future opportunities. See for example, [1-11].